“When I first heard ‘super Tuscan,’ I thought we were talking about unleaded fuel, not wine,” says Roberto Guldener, who runs Terrabianca in Radda in Chianti and makes several super Tuscans. Some people define super Tuscan as a Tuscan blend made with Cabernet Sauvignon or other international varieties. Others define it as a wine that breaks ranks with Italy’s strict Denominazione di Origine Controllata (DOC) quality regime. Others define it as any expensive wine from Tuscany. The truth is super Tuscan is all those things—and none of those things. A super Tuscan can be a 100 percent expression of Sangiovese with absolutely no international varieties. It can be a DOC wine, and in fact many are, and it can span any price point from $12 to $275. In the 1970s, some Tuscan producers came to believe that the legal rules governing the production of Chianti were too restrictive. (For example, they required the use of some white grapes in this red wine, and they prohibited blending in non-traditional grapes such as Cabernet Sauvignon, Merlot or Syrah.) Or these vintners wanted to make wine outside of the allowed Chianti zone. They coined the term “super Tuscan” to distinguish their wines from the inexpensive, low-quality wines that were associated with the term vino da tavola, or “table wine,” that they were forced to put on the label. Today, most super Tuscans use the legal appellation of IGT (Indicazione Geografica Tipica), which gives producers more flexibility than Chianti and other Tuscan DOCs and more prestige than vino da tavola. The wines tend to be modern, big and rich—and often carry a price tag of $100 or more a bottle. 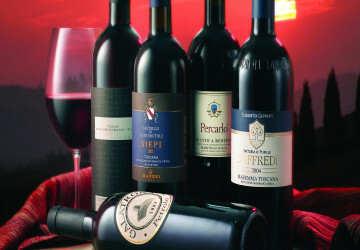 Some super Tuscans do contain Sangiovese, either 100 percent or in blends. But others are made solely from Merlot (such as the famous Tenuta dell’Ornellaia Toscana Masseto), from a blend of Cabernet Sauvignon and Syrah (Riccardo Baracchi Toscana Ardito), or from even more unusual blends, like an amalgamation of Petit Verdot, Cabernet Sauvignon, Syrah and Merlot (Argiano Toscana Solengo).